Ubuntu for Android is a custom Ubuntu OS running on the Android mobile phone that able give full desktop experience like destop computer. Canonical as the motor of Ubuntu project has made modifications to Ubuntu OS so it can be installed on Android phone. In its swebsite, the user was promised that they can have full desktop experience when their Android phone is connected to a monitor, keyboard and mouse. Amazingly the presence of Ubuntu OS will not replace the presence of the Android OS, but both of them will run simultaneously. Ubuntu and Android operating systems will use the same kernel, data and resources. By doing that, the user can access the functions of the phone, sms, video, music, etc while they running an application in Ubuntu. Unfortunately not all Android phones will be able to install Ubuntu, only Android phone with dual-core processor, HDMI connections, USB and docking capabilities that could perfectly install Ubuntu on Android. 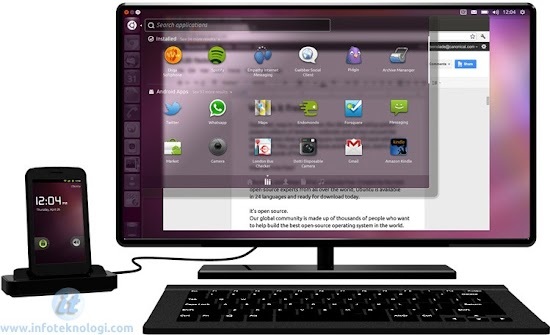 Check out the demo video above to see the Ubuntu OS that runs on Android phones in action.